I’m in love with this. It matches my bathroom which is where I put it for my foster son and not long after I found out I was going to be a gma. Now I’m a foster mom and it’s still going strong. This country style changing table in features rounded contours for your baby's safety and comfort. 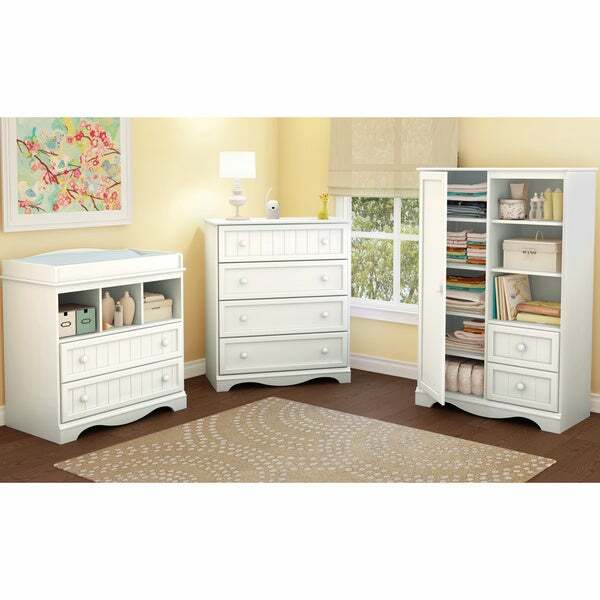 The two practical drawers are equipped with matching wooden finish knobs and the three open storage compartments keep baby products within reach. Also featured, are drawer slides with integrated safety catches and soft-closing mechanisms to prevent accidents. Dimensions 20.0 In. X 34.0 In. X 37.0 In. Simply Beautiful! We recently added this changing table to our nursery and it is amazing... The 2 drawers are spacious and the the 3 spaces work very well as the storage space for the essentials. This changing table provides the perfect size and functionality for a baby. Very sturdy and moderately easy to assemble. It did come dinged at first, but overstock sent me replacement parts quickly. This is great furniture and very reasonably priced. This piece arrived on time and in perfect condition. We love it in the baby's nursery! This item was easy to assemble however, it broke very quick. It does not hold up very well. Item drawers are flimsy and cannot hold much weight. Nice quality for the cost. It's sturdy and looks very nice in my daughter's nursery. my son-in-law put this together and was not very happy. He said the instructions was not clear enough. The screws were not clearly distinguished or clear. the instructions need to be clearer. "Is the white a true white? Or more of a creamy white?" "What size pad fits the changing table. Is it 30,32 or 34. What's the changing tables dimensions "
Very cute! matched the armoire i liked in the correct color.